An ATARI style top down 2D action adventure game in the style of classic handheld Zelda games. The sprites were designed in Photoshop and the whole level was planned, designed and created in Microsoft Excel. Made in the style of the classic game console ATARI 2600. Defeat the enemies and bosses foolish enough to stand in your way on your quest to return the crystal of life back to diamond mountain. This was an individual project made in Unity, sprites and animation where made with Photoshop. The game was made in over 3 weeks. The class was assigned to make a game in the style of a classic console, I was given the Atari 2600. I never owned or played an Atari as a kid so I had to do a lot of research on Atari games and of course the limitations of the console. The Atari 2600 was released in 1977, the screen resolution was 160 x 192 and the console was only able to display one color per horizontal line. As you see from the image above no horizontal line has more than one color. It was difficult to stay with this limitation because of the game I was trying to make so the lecturer gave us some leeway just as long as we deviate too much from the source material. All that was left was to choose what kind of game to create. I chose the classic Zelda games; A Link to the Past, Oracle of Seasons & Oracle of Ages. All sprites were created in Photoshop, from the main character to the giant key statue and the animated flames. I created the whole level in Microsoft Excel. I exported the cells to Unity and added boundaries for where the player couldn't go. I wrote a small 2d script to move the player using only the x and z axis as movement as it was a top down game. I made sure the player movement was fast as I wanted the controls to be smooth. The camera script was one I found online but was modified with a trigger to follow the player whenever he entered a new room. Even animated it to be just like the classic top down Zelda games. The character had only 1 ability which was to move objects and this was really all that was needed to solve puzzles. I also intended to add the ability to shoot arrows to solve puzzles but that was scrapped because of time constraints. They were originally supposed to be enemies in the game but I decided against that as there wasn't enough time to properly implement them. I settled on a classic Zelda based dungeon design with hidden doors, switches that open doors, keys in chests and moving platforms. Also moving platforms because why not!! And of course, switches that open doors. This was the first 2D game I ever created and it was fun experience. 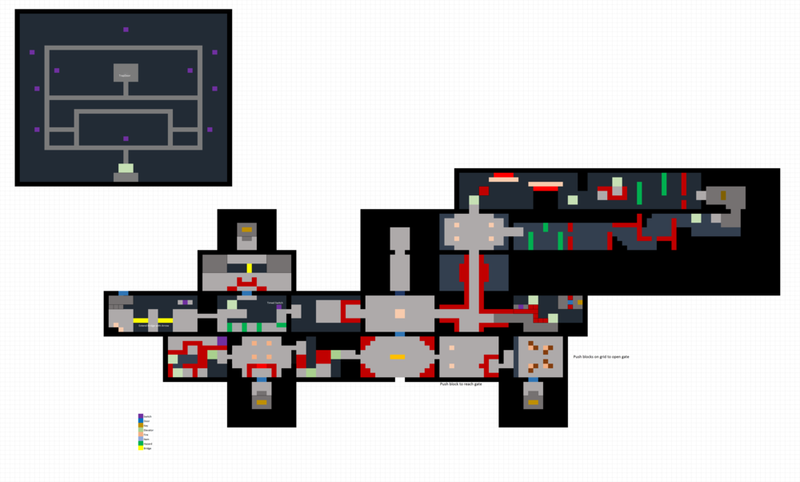 This is the full outline of the level taken from Excel. I had to use simple colors to be able to meet the limitations of the ATARI.